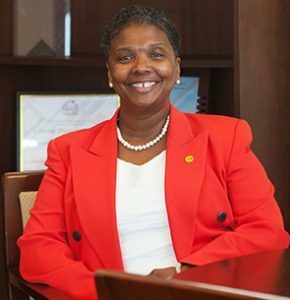 Dr. Colette Pierce Burnette, a native of Cleveland, Ohio, joined Huston-Tillotson University as President and Chief Executive Officer on July 1, 2015. Prior to joining Huston-Tillotson she served as interim President for Pierce College in Puyallup, Washington, the Vice President for Administration and Chief Financial Officer, Executive Assistant to the President, Vice President for Information Technology and Services and Chief Information Officer at Central State University in Wilberforce, Ohio, and Dean of Information Technology at Pierce College in Lakewood, Washington. Before transitioning into higher education, Dr. Pierce Burnette worked as a Computer Analyst at The Washington Post, an Operations Support Engineer at Proctor and Gamble, Director of Information Systems at Neighborhood Reinvestment Corp., Manager of Consulting and Project Management Services at the Washington State Department of Transportation in Olympia, Washington and ran her own computer consulting firm, CompuMent.